The name of the Bounty, frigate of the British Navy, is famously tied to its captain's Bligh and the mutiny of the crew. The ship set out Spit head in December 1787, final destination Tahiti. On the return voyage, owing to the strict discipline imposed by the captain, which clashed with the idle stay in Tahiti, a certain discontent began to spread through the crew and it soon turned into a mutiny. Christian Fletcher, the boatswain, took command of the ship and forced Bligh to embark on a life-boat with 18 still faithful men. After a dangerous navigation for more than 4000 miles, Bligh reached the isle of Timor and afterwards England. The Bounty went back to Tahiti where part of the crew landed. Then it sailed for the Pitcairn Isle where Fletcher and the remaining men settled. Only 20 years later the group landed in Tahiti was captured and tried by the English Court-martial. Only three seamen where condemned, while the others were acquitted. 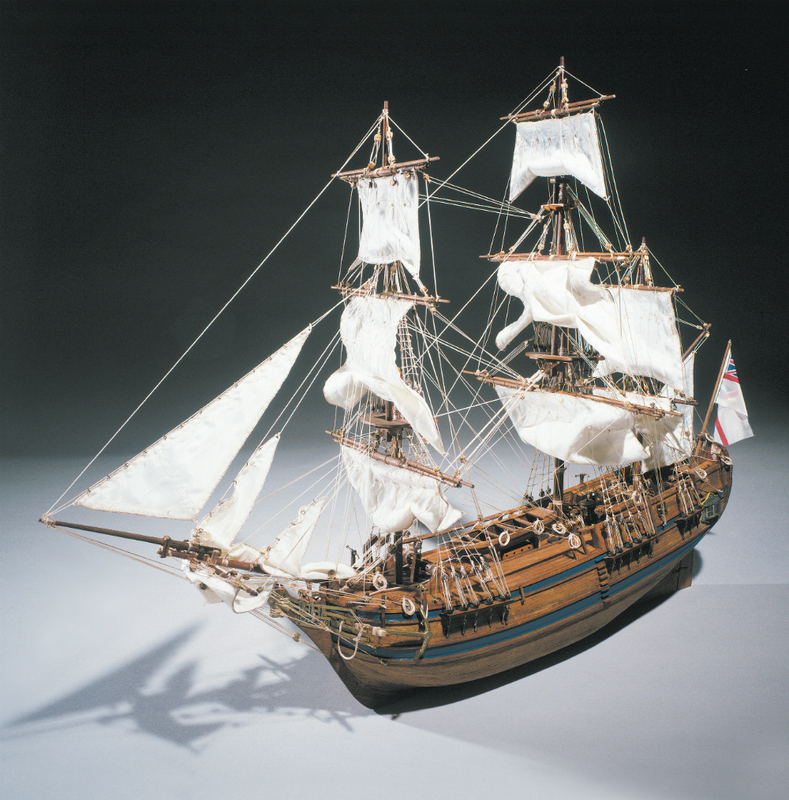 The kit of the Bounty Features a double plank on frame hull construction, building plans with general details, English instructions, lost wax brass castings walnut and lime planking, wooden masts and spars, brass and walnut fittings, laser engraved details, rigging cord, sailcloth and silk flag. All sheet ply sections are laser cut for accuracy.